Digital Photography Review: After the rather uninspiring noise performance of the Panasonic LX1 and overblown image processing of the Olympus Stylus 800 I approached the update to the excellent PowerShot S70 with some trepidation. So it was a great relief to discover that the S80 (which we presume to use the new Sony 8MP chip) not only offers noticeable improvements in performance and control, but also manages to increase resolution without a significant increase in noise. Like the S70 before it, the S80’s key selling points are the 28-100mm lens range (which is much wider than most zoom compacts), full photographic control and a build quality and design that oozes quality. The addition of dedicated ISO and AE-compensation buttons on the body make the photographic process a lot more fluid, and the results are superb. Most of the serious issues we had with the S70 – including purple fringing and focus problems – have been eliminated, and the result is a camera that seems perfect for the serious photographer itching for SLR – style control in a compact body. Canon is also to be praised for the lack of heavy-handed image processing, with the S80 producing clean, artifact-free images that respond well to post processing and have a remarkably natural look. Of course many potential users will be put off by the lack of raw file support (an inexplicable omission given that the S70 had it), but the JPEGs are very good, and if you turn down contrast, saturation and sharpness you get an excellent starting point for some serious post processing. There are inevitably some problems – the ambitious 28mm equiv. wide end of the zoom involves a certain amount of compromise; mild CA and the occasional softness in the corners of images can be reduced by dropping the aperture (and only really show up in big enlargements), but cannot be ignored or excused. I also found the new multifunction dial took a long time to master – you have to remember when you need to press it (using it as a standard ‘four-way controller’) and when to spin it, but I did eventually get the hang of it. Of course having so many buttons over the body means the risk of accidentally pressing one is fairly high, but I found this wasn’t a problem as long as I held the camera with both hands. So then, the S80 is a camera that proves there is hope for the new generation of 8 megapixel compacts. I was ready to blast Canon for another pointless upgrade, but as the review progressed I started to appreciate that this was not just a worthwhile upgrade, it was probably the first time I’ve found a PowerShot I’d actually lay out my own money for. I toyed with the idea of a recommended simply due to the lack of raw support, but given that – with careful exposure – the JPEGs are so good, I felt that would be unnecessarily harsh. LetsGoDigital: All in all the Canon PowerShot S80 is an extremely interesting digital camera. It seems a rather stubborn one, but definitely one that proves itself worthy. 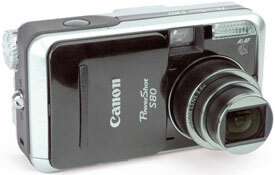 The PowerShot S80 is found on the top in its price range. Most changes compared to the S70 are for the user’s benefit. A few minor changes (like the return of RAW format!) and the Canon PowerShot S80 will be one of the best versatile digital cameras currently available; it’s absolutely a recommendable camera! TrustedReview: Although it is scarily expensive, the PowerShot S80 really delivers. It has enough creative options to satisfy any keen photographer, and delivers results that are among the best I’ve seen. Performance, design and build quality are all of the high standard we’ve come to expect from Canon. If you got the money, it’s one of the best compact cameras you can buy. CNet: The good: Great image quality; snappy performance; sturdy and attractive. The bad: Vignetting at widest angle; slowish lens; no uncompressed or raw-file support; jaggies and audio noise in movie mode. The bottom line: Aside from one or two very minor lens shortcomings, Canon’s new flagship S-series model stands out in its class. Digital Camera Resource Page: Beginners, enthusiasts, and tech geeks will all find something to like on the S80. If you’re just starting out you’ll be pleased with the camera’s selection of automatic scene modes and fancy movie mode. More experienced shooters will like the full manual controls the S80 offers, plus handy things like focus bracketing, a live histogram (finally! ), and a custom spot on the mode dial. PowerShot S80 owners can also control their camera right from their Mac or PC by using the included software. And finally, nerds like me will certainly enjoy the way the camera rotates images on the LCD when the camera is rotated to the vertical position. Even with some flaws, the S80 still offers a compelling package with its wide-angle lens, manual controls, and sleek design. It gets my recommendation, but it’s worth checking out the competition as well, as they’re also very good cameras. Steve’s DigiCams: With an MSRP of under $550, the Canon S80 presents an excellent value among high-end consumer digicams. With 8 megapixels of resolution, a versatile optical zoom range of 28-100mm, excellent image quality and a stylish pocketable design, it has broad appeal for recording family events and travel. It is capable of being used by photographers of every experience level, providing plenty of automation for the beginner and ample controls for the advanced user. The average size of a 8-megapixel Superfine image is nearly 5-megabytes, so make sure that you get an SD memory card large enough for a days worth of shots. And because the S80 can not be powered by common batteries, make sure that you get a spare NB-2LH battery, keeping it fully charged so that you don’t miss that once in a lifetime photo op. The S80, like its S70 predecessor, is an excellent camera, one that I can again highly recommend. PC Magazine: The Canon PowerShot S80 is a solid compact camera that takes excellent photos. It may be a bit expensive, but as versatile compact digital cameras go, you’ll be hard-pressed to find something better. Megapixel (link dead): Positives: Good image quality, reliable evaluative metering, dial functions of the multi control dial very practical, 28 to 100 mm equivalent zoom, available 1024 x 768 pixel movie mode, well-rounded set of shooting modes, solid and elegant construction. Negatives: Soft focus images, multi control dial’s functions too complex, no RAW image format, compression sometimes a bit too strong at the highest image quality, flash light fall off in the corners of 28mm images, average LCD monitor resolution.